How’s camera technology these days, huh? From Go Pros hurtling out of the stratosphere, to the latest face-swap app on your iPhone, to new technology that could lead to cameras based inside human eyes, it seems like there’s nothing we can’t do when we put our lens to it. But this all pales into comparison when you consider what our Australian Square Kilometre Array Pathfinder (ASKAP) can do. You may have heard about ASKAP already: it’s a next-generation radio telescope incorporating novel receiver technologies and leading-edge ICT systems. Made up of 36 identical antennas, each 12 metres in diameter, ASKAP works as a unified single instrument, or interferometer, to capture radio images of the sky in more detail and faster than ever before. It will allow astronomers to find answer to fundamental questions about our Universe, including dark matter, dark energy, the nature of gravity, the origins of stars and galaxies, and more. And it’s just created an image of the cosmos with the most number of ‘beams’ ever produced with a radio telescope to date, trained to the one patch of sky. The radio image was produced using nine ASKAP antennas, recently installed with our newest Phased Array Feed (PAF) receiver systems. The PAFs were configured with 36 dual-polarisation beams arranged in a 6×6 square footprint and rotated on the sky. The team observed a single field for 11 hours, with 48 MHz of bandwidth centred at 939.5 MHz. Which, we’re assured, is all rather impressive. The continuum image produced with ASKAPsoft. If you look really closely you can see my house! Which may not appear much at first, but each of those little dots? They’re radio sources, like galaxies, and there are more than 1300 of them in that image. 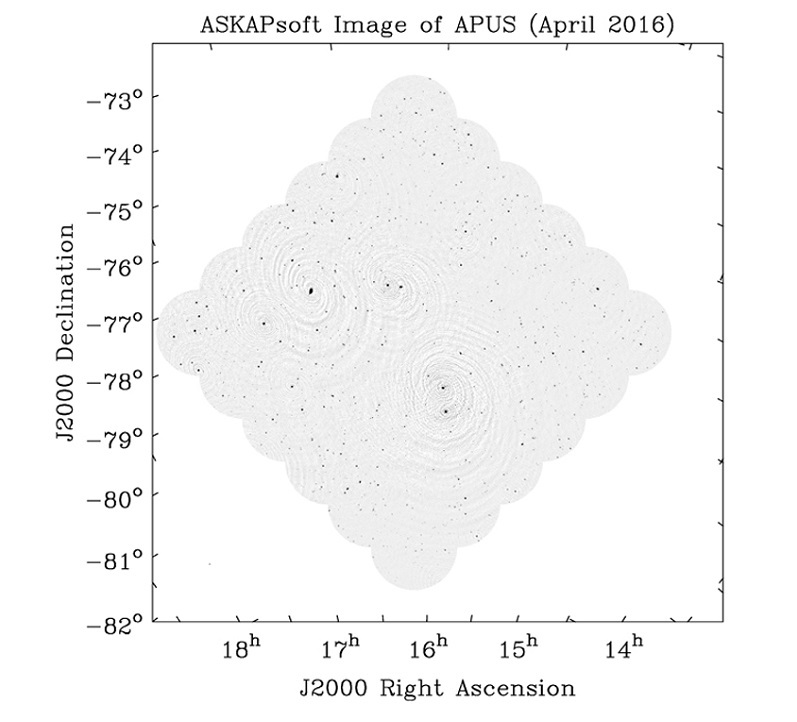 Covering 30 square degrees, this represents the full ASKAP field of view, equivalent to around 150 times the area the full Moon. The field targeted for this observation is in the Apus (‘bird of paradise’) constellation. This area of the sky has become a ‘standard’ test field for the ASKAP commissioning team, due to its proximity to the South Celestial Pole and that it contains an arrangement of several strong sources. The resulting continuum image was produced using a bespoke software package, known as ASKAPsoft, run on the real time computer housed in the Pawsey Supercomputing Centre in Perth. 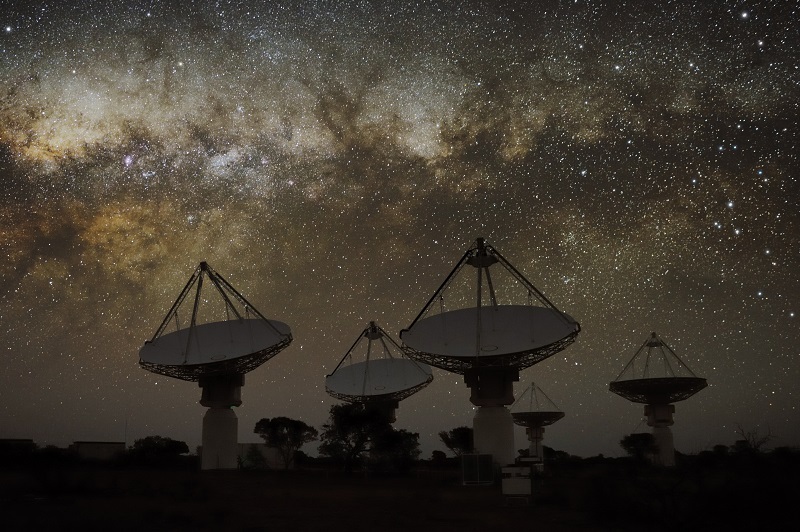 ASKAPsoft will analyse the data that will flow from the ASKAP telescope – around 2.5 GB/s – rates that no other current software package will be able to handle. This image not only represents that ASKAP’s newest receiver systems work, but also that ASKAPsoft has matured to deal with large quantities of data and produce images of the same high quality as other well-established software packages. It is a testament to the power of ASKAP as a high resolution, wide area, survey telescope; and to the team who designed, built and are now commissioning the telescope. And it sure beats your last Instagram selfie. For more information on ASKAP, visit our website. Well Done, How does ASKAP shape up against China’s FAST. What differences are there apart from the size ? what uses do both systems have ? Thanks for the question! The main difference between the two systems is that ASKAP is good at simultaneously observing large areas of the sky with less sensitivity but higher resolution, while FAST is very good at observing smaller areas with lower resolution but with much more sensitivity. This makes ASKAP ideal for rapidly doing surveys of the sky, while FAST is ideal for pulsar science and observing more extended structures. In fact, the two instruments are quite complementary in many ways, including being in separate hemispheres which gives each a different window to the Universe. Other differences include a multi-pixel feed receiver (developed by CSIRO for FAST) vs phased array feed receivers (developed by CSIRO for ASKAP), and ASKAP’s antenna dishes can move around three axes. Do the radio telescope images correspond to visible light images? Does using radio wave lengths give greater penetration and distance? Is there the equivalent of a Doppler shift from which distance may be calculated? Like visible light, radio waves form part of the electromagnetic spectrum. Astronomers use instruments that are sensitive to essentially the full range of the spectrum, from radio waves at the lowest frequencies to x-rays and gamma rays at the highest. Different processes in space give rise to emission in different parts of the spectrum, so by covering as much of the spectrum as we can we obtain a better handle on the physics of the objects that we are studying. The ASKAP image above, like most images of space (even those at optical wavelengths that our eyes are sensitive to), is ‘false colour’. Images tend to be presented in a way that makes them easier to interpret. As to your second question, the answer is yes! Light at optical wavelengths is prone to absorption by dust clouds in space. You can see this happening in many pictures of nearby galaxies which often show magnificent, dark dust lanes in their spiral arms, and indeed in our own galaxy, where the dust in the plane of the Milky Way defines “the Emu in the sky”. Radio waves pass right through this dust. A typical picture of the night sky in optical light will be dominated by stars in our galaxy. Most of the dots in a typical radio picture like the ASKAP image above are actually other galaxies that are billions of light years away. Finally, astronomers regularly make use of the Doppler shift. Certain atoms and molecules in space emit narrow lines of radiation at very specific frequencies. Measuring a broadening or a shift in these lines reveals a lot of information about how the gas is moving relative to us, and to other objects in space. The Doppler shift is relevant to astronomy on all scales, from our own solar system, stars in our galaxy, the motion of gas in nearby galaxies and even tracking distant galaxies moving in the “Hubble flow”, the motion of objects due to the expansion of the Universe itself. Thanks a lot for your interest and questions Ron.